It was around four thirty in the afternoon and I was just about templed out. Sitting in an ’83 Toyota Camry, watching the forest trees wiz by in a blur of dark green interspersed with glimpses of light, I mentally recalled my checklist of things done during our whirlwind visit to the Angkor of the ancient Khmer empire. Watch the sun slowly inch its way above the Angkor Wat complex from the Central Sanctuary of Phnom Bakheng....Check. Ride a hot-air balloon to get an aerial shot of Angkor Wat emerging from the forest …… Check. Pay homage to the Creator at the Gallery of a Thousand Buddhas...... Check. Thump chest and hear the resonance in the Hall of Echoes… Check. Strike a graceful pose in the Hall of Dancers at Preah Khan ….. Check. Pass through the Gate of the Dead where a jumble of gods and demons stick out of the soil like victims of a horrific cosmic pile-up.…Check. Visit Ta Prohm, home of the twisted and convoluted Tomb Raider tree… Check. We had taken enough pictures to fill 2 memory chips, eavesdropped on numerous guided tours, and logged enough miles to get to Batangas City and back. Miles and I had talked of going to Angkor Wat since we were newlyweds. The months leading to our trip were filled with late nights spent searching for the best accomodations (read: less than $10 a night); struggling with the language barrier to book budget airline tickets through a Bangkok travel agency; and scouring through the archives of Thorn Tree (Lonely Planet), Travelfish, The Daily Main and NY Times to put together an eclectic itinerary. 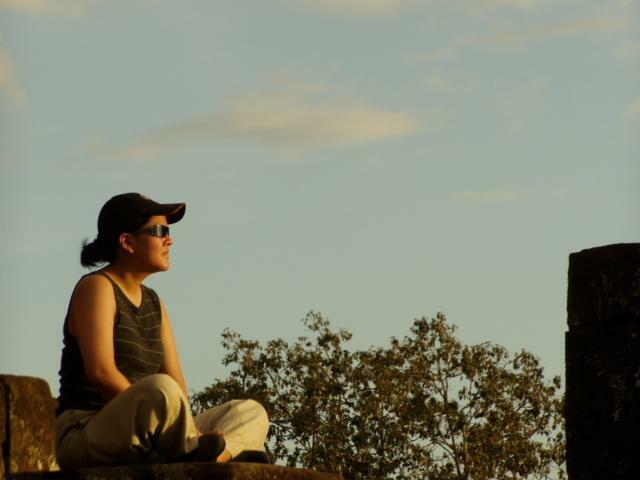 By the time we left Manila, I was running on adrenalin and ready to be impressed. Two days later and I felt like a day-old birthday balloon slowly losing air. Something was missing. Maybe it was over anticipation. The mythical image that I had sketched of Angkor in my sepia-colored dreams was such that the reality fell far short of my expectations. Silly me….I had not taken into consideration the busloads of retirees from Europe, Japan and America. It was Disneyland without the walking mascots. Everybody and his mother wanted a picture of the most prominent apsara (celestial nymph) and/or most impressive garouda (symbolic protector of the air and water). It was hard to find a spare moment to contemplate and absorb the majesty of the ancient, intricately carved temples when every 15 minutes, a new bus would disgorge another gaggle of noisy, camera toting tourists from hell. It was with a great sigh of relief that we escaped to the tranquil Angkor Café. There we reveled in melt-in-your-mouth Blue Pumpkin gelatos while browsing through the outstanding (and expensive) wood and stone masterpieces of the Artisans d’Angkor. All in all, a wonderful experience but still, something was missing. I was still unfulfilled. Our patient driver must have noted our slow, inevitable descent into catatonia. “Last one, last one. Ta Keo. Not far. ” Music to my ears. I perked up and trawled through my dog-eared secondhand guide book for a description of the place. We rounded a bend and behold, there was Ta Keo, “The Mountain with Golden Peaks”. I was immediately struck by a sense of solitude. There were only one or two pairs of people slowly making their way down the steep stairs. We climbed (in my case, crawled) up at our own pace. 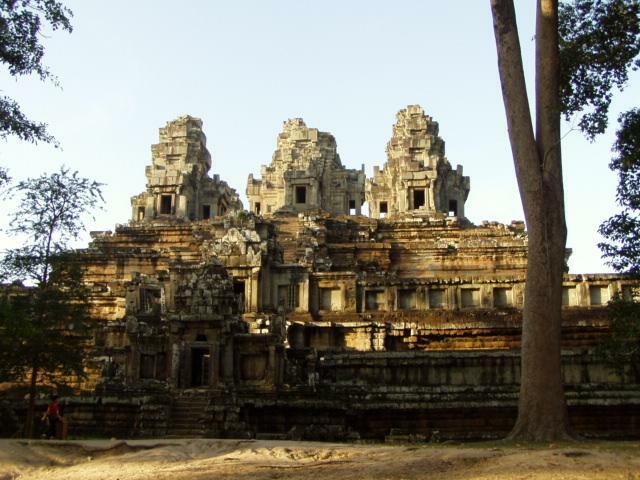 Ta Keo is one of the great temple-mountains at Angkor dedicated to the Hindu god Shiva, the Destroyer of Evil. It is an earthly replica of Mount Meru, the sacred dwelling place of the gods. Built between the end of the 10th century and early 11th century, Ta Keo rises 72 feet to the sky. Composed of enormous interlocking blocks of greenish-grey sandstone, work on the majestic temple was abandoned just after the start of its ornamentation. Archeologists have not yet confirmed why it was uncompleted, although many point to the death of King Jayavarman V as the root cause. 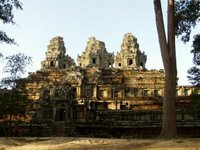 Had it been finished, it would have been one of the finest temples in Angkor, one of the first to have been built of sandstone. The sheer simplicity of the structures that remain leaves an indelible impression of stoic strength and power. Centuries have passed, kingdoms have risen and fallen and Ta Keo remains… a silent link between man and the heavens. I grunted and groaned my way to the top. Ta Keo is a structured pyramid conforming to the usual rule of proportional reduction. As I got closer to the peak, the steps grew exceptionally narrow and muscle-punishingly steep. At one point, I was inching my way up on my hands and knees like a supplicant on pilgrimage. I reached the central tower, gingerly turned around and gasped. The sun was just beginning its descent into night - its brilliant red, orange and yellow hues setting the giant treetops before me afire. I spent another 20 minutes in quiet contemplation, soaking up the grandeur of the panoramic view. I rediscovered my inner center there, listening to the distinctive song of the cicadas and reflecting on the faith which inspires ordinary people to create extraordinary pieces of work as an expression of their devotion to a higher being. The memory of my laborious ascent up this great, unfinished temple-mountain now serves to remind me that my life is a work in progress, constantly striving for self-knowledge and unity of being.